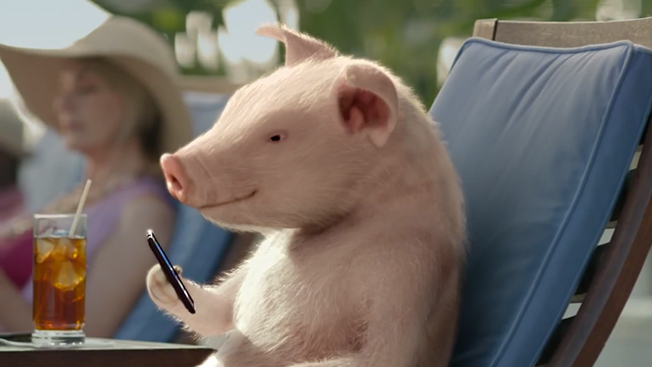 Last year, Geico and Portlandia had fun with the insurer's pig character, Maxwell, in an IFC spot that referenced the comedy's farm-to-table skit. Now they want to take the talking swine all the way to the Rose City mayorship. Geico's spot, called The Nomination (see below), debuted on Feb. 27 during the first episode of Portlandia's fourth season. Maxwell accidentally throws himself into the mayor's race during a community meeting, which was called to address the current mayor's lack of action in terms of Portland's excessively long brunch lines. A second Geico commercial, dubbed Brunch Line, also aired, pushing the #Maxwell4Mayor storyline forward. A passionate Maxwell supporter rallies at a "Meet the Candidates" brunch while surprising the pig on line for food. Like last year's spots, the ads are designed to have a Portlandia look and feel. Over the weekend, the brand started encouraging social media users to submit their best campaign slogan with the hashtag #Maxwell4Mayor. The effort is being pushed to the show's 647,000 Facebook fans and 88,000 Twitter followers as well as through digital properties owned by IFC, part of AMC Networks. "We are a small network and really do need to over-deliver on creativity," Kim Granito, IFC's vp of integrated marketing, told Adweek. "As we planned for the campaign, we really wanted to blow it out, which is why we added the layer of social media onto it." Granito said roughly 200 slogans have been submitted in two days. She suggested that the show's fan base hasn't been turned off by the Geico TV-social integration. "There's really been no negative feedback," she said. "Portlandia has a really smart audience. And when they don't like something we are doing, they tell us." Lauren Silverman, national television director for Geico's media agency, Horizon Media, added that the brand's team is "eager to see the excitement around the Maxwell for Mayor campaign" throughout the next several weeks.